GreenWorks is part of a multi-disciplinary team on the renovation of this regional waste water treatment facility in historic downtown Oak Harbor, Washington. Situated in Windjammer Park on the shores of Oak Harbor the facility will take advantage of technological updates to modernize the facility, integrate it with the surrounding environment and reduce its visual and olfactory impacts. Pedestrian and automobile circulation on either side of the facility provides primary access from downtown Oak Harbor to Windjammer Park and the waterfront. The site plan requires the creation of strong physical and visual links along these axes. The planting and hardscape will reflect the coastal setting with the inclusion of rolling dunes planted with coastal grasses and perimeter sidewalks that will emulate local wooden docks. Parts of the facility will be exposed to the public offering opportunities for interpretation along the two main thoroughfares. Located at the City Center, this mixed use office/retail project was envisioned to be a catalyst for town center redevelopment. GreenWorks designed the site improvements to reinforce pedestrian and visual connections to the urban fabric and to the Columbia River Gorge area as a demonstration project. GreenWorks implemented goals for a sustainable development model by creatively designing stormwater solutions, rainwater harvesting, a central courtyard, and native plantings in an urban context for the one block development. GreenWorks used 3-D modeling to enable the design team, developer and local staff to visualize design solutions. This project is one of the 10 LEED-ND pilot projects by the USGBC for the nation. Fernhill Wetlands is part of a 748 acre parcel near Forest Grove, OR, owned by Clean Water Services and managed in partnership with Forest Grove. The site, located within the Tualatin River Watershed, consists of agricultural fields, wastewater treatment and other public utility facilities, and several pristine wetlands which are open to the public and draw birders from far and wide who come to observe the many rare migratory bird species that stop at the wetlands during their journey. With future plans to integrate the wetlands into the wastewater treatment process as part of a natural and sustainable cleansing and cooling approach that preserves the site’s ecological and recreational significance, Clean Water Services commissioned GreenWorks as consultants who bring extensive experience in constructed wetland and green infrastructure design. In collaboration with CWS, GreenWorks developed a master plan vision for the site which included an overall site layout consisting of treatment wetlands, roads, trails, overlooks and other public spaces; a graphic representation of the water circulation path from wastewater treatment facility all the way to the Tualatin River; accompanied by a collection of artistic photorealistic renderings from various vantage points, which will collectively be used to clearly convey design intent throughout future project phases. The Unified Sewerage Agency contracted with GreenWorks as part of a team of engineers, biologists, and hydrologists, to develop wetland development concepts for a large-scale wetland mitigation bank, along Gales Creek in Forest Grove. The concept plan recommendations included the establishment of ash forest wetland, emergent marsh and scrub-shrub wetland, wet meadows, and oak woodland upland buffers. The 33-acre Zidell Yards site offers the first holistic, comprehensive opportunity in Portland, Oregon to identify solutions for applying green infrastructure to manage stormwater on one of the largest brownfield remediation and redevelopment sites in Portland. The goal of this effort was to develop a range of comprehensive green infrastructure scenarios consistent with the constraints of a recently remediated brownfield that can be implemented within the framework of a 15- to 20-year development master plan. As part of ongoing development at the 930-acre Chambers Creek Properties, GreenWorks developed schematic design and construction documents for long-term sustainable stormwater strategies integrated with perimeter landscape buffers for the existing Chambers Creek Wastewater Treatment Plant (CCWTP) wastewater treatment plant and planned expansions. Working closely with Pierce County staff, Brown & Caldwell engineers, and Michael Willis Architects, GreenWorks developed the landscape buffer concept to visually and physically screen the treatment plant. The buffer serves to blend the treatment plant area harmoniously with the dramatic landscape of south Puget Sound, surrounding land uses and future development on and off the plant site. The design incorporates stormwater management facilities that treat plant runoff, provide new recreation trails that connect with existing trail networks, and improve wildlife habitat. The buffer must also accommodate support facilities for bus traffic and large crowds attending the 2010 PGA US Amateur’s Open and the 2015 US Open to be held on the adjacent Chambers Creek Golf Course. In addition to the perimeter buffer, GreenWorks is working on the redevelopment of the plant entrance to improve visibility and enhance circulation. GreenWorks provided landscape architecture services in master planning a new 2.8 acre mixed residential development near the headwaters of Tryon Creek. The project includes a variety of residential types including elderly housing, town homes, and a Portland Development Commission (PDC) built low-income apartment building. All of the new residential developments, along with an existing apartment building, were designed to be integrated with the daylighting of a tributary of Tryon Creek. The development was coordinated with many local agencies (PDC, Portland Department of Transportation, Portland Parks and Recreation Bureau, and Bureau of Environmental Services) to extend the daylighting project from the headwaters of the tributary in a park adjacent to the site, through the site and adjacent neighborhood to Tryon Creek. The goal of the developer and the design team was to incorporate the buildings, parking, plazas, bridges, and other site elements into a cohesive sustainable site development that takes full advantage of this daylighting opportunity. GreenWorks services include schematic design, design development, construction documentation, and services during construction. This project is certified LEED Silver. GreenWorks conducted a preliminary investigation on the Blue Heron Paper Mill site, which included research on the site’s history, river access investigations, preliminary concepts, and magnitude of cost estimate. The purpose of this work was to gain a better understanding of the potential to provide public river access, as well as for other recreational, interpretive, open space amenities and economic redevelopment features. Celebration of the Willamette Falls and its cultural significance over the decades is also an integral component of the concept. GreenWorks built off this initial effort to develop a vision for the site that is inspired by the 3 main eras evident on the site—the Natural Era, Cultural Era, and Industrial Era—all interweaving to become an expression of a new era of sustainability for Oregon City. New initiatives will target public open space, economic redevelopment, interpretive facilities, Falls overlooks, and riverbank restoration. The Lake Oswego – Tigard Water Treatment Plant is being expanded to serve future demands forecasted for the Lake Oswego and Tigard service areas. GreenWorks provided landscape design for stormwater management and to address visual impacts for components of the plant that could be seen in residential areas as well as providing amenities for neighborhood use. Amenities included a neighborhood trail, public open space for neighborhood use, and native woodland enhancement. GreenWorks actively met with the adjacent neighbors to hear their concerns about the project and with the broader community at workshops to describe landscape / site design elements for public comment. The West Eugene Wetlands Education Center will build a framework for learners to embark on their quest for knowledge and understanding of wetland ecology. The Center is located in the watershed of the Long Tom River, a major tributary of the Willamette River. The West Eugene Wetlands comprise 3,000 acres of rare habitat, protected and restored by the West Eugene Wetlands Partnership, a unique partnership of state, federal and private agencies. GreenWorks is providing landscape architectural services for the design of the center using the highest standards of sustainability. Moving beyond the requirements of LEED Platinum Certification, we are looking at how to restore and enhance the site for wildlife and plants, including the endangered Fender’s Blue Butterfly and Kincaid’s Lupine. Restoration of the disturbed upland habitats and sensitive design will provide a balance between protected habitat and thriving human activity and commerce. The site design includes plaza entry areas, green roofs, parking lots, site circulation, trails, and interpretive areas. The former ODOT Headquarters located on the Capitol Mall in Salem was an aged building suffering from inefficient systems. As part of an architect-led design team, GreenWorks addressed these deficiencies in an extensive renovation. The primary goal of the renovation was to transform the existing building into a sustainable high performance building that would provide the best long-term value for the State within the project constraints. 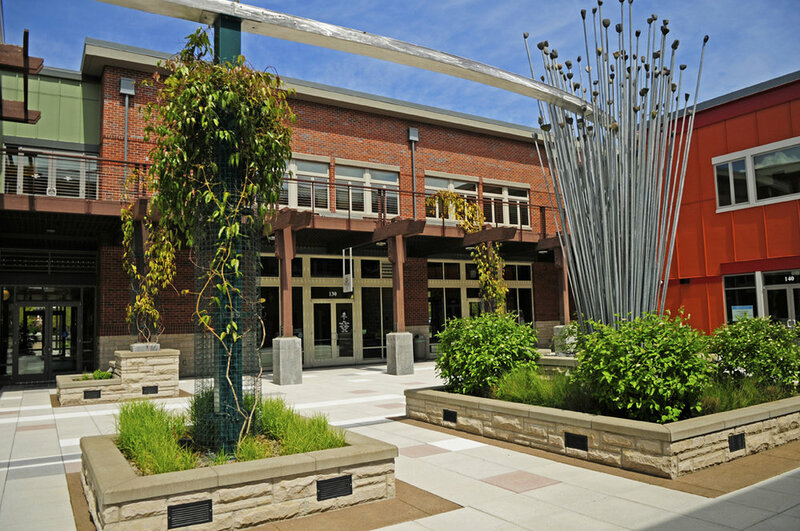 GreenWorks provided schematic design landscape architectural services addressing site sustainable strategies, green stormwater solutions, circulation, maintenance, plaza replacement, safety, and ADA accessibility. The project is certified LEED Platinum. The Eastbank Crescent Project is located between the Hawthorne and Marquam bridges on the eastbank of the Willamette River. The purpose of the project is to create a recreational destination and a fish and wildlife habitat refuge. The project is a collaborative effort between City of Portland’s Bureau of Planning and Sustainability, Bureau of Environmental Services (BES), Portland Development Commission, Portland Parks and Recreation, GreenWorks, Mayer-Reed, and Flowing Solutions. Based on existing conditions analysis, constraints and opportunities, three concepts were developed including maximizing recreation, maximizing habitat and a hybrid of the two. GreenWorks, with sub consultant, Inter-fluve Inc., was task by BES to enhance in-water nearshore habitat for ESA-listed fish, restore riparian and upland habitat for birds and wildlife, and incorporate river habitat education opportunities. An array of habitat treatments were considered including laying back the riverbank to create more habitat by vegetating with native plants, undulating the shallow water area with alcoves or backchannels to enhance fish habitat and creating viewpoints and access for education. The concepts were presented to stakeholders and the public and a preferred alternative will be developed based on public input. GreenWorks developed a Stormwater Retrofit Master Plan for the Oregon Zoo at the request of the Portland Bureau of Environmental Services in partnership with the Oregon Zoo. The Oregon Zoo is one of Oregon’s top tourist attractions and is ideally suited for public education related to environmentally-responsible and sustainable site design. Subsequently, GreenWorks was contracted by METRO to implement parking lot and Greenstreet improvements, at this major tourist attraction, to treat and detain surface runoff, provides public education and creates aesthetic improvements. GreenWorks was part of a design / build team to implement strategies that included stormwater filtration for street runoff and flow-through stormwater planters for parking lot runoff treatment. The project was funded by an EPA grant. GreenWorks developed a Site Master Plan for the new Head Start Facilities in Clackamas County. Through creative treatment and handling of stormwater the Playground and Outdoor Courtyard Classroom on site create learning opportunities related to water and the environment. The Playground features a variety of outdoor activities for active play and discovery, including a play structure, tricycle track, and fossil themed sand box. The nature trail, along with raised garden beds, provides lessons in science, observation and stewardship. The Outdoor Classroom, or courtyard, focuses on connecting students with the physical properties of the water cycle; falling rain, run off as stormwater, evaporation, and transpiration. The courtyard is a place of dynamic activity highly influenced by the environment, the sun and the rain, and easily visible to students from inside the building. GreenWorks was contracted by the Portland Bureau of Environmental Services to develop hand –illustrations of various stormwater facilities for a variety of Bureau uses. The illustrations included parking lot swales/infiltration facilities, courtyard infiltration facilities, rooftop disconnect infiltration facilities, and stormwater planters. GreenWorks and Inter-Fluve recently helped Clackamas County Water Environment Services prepare an application for METRO’s Nature in Neighborhoods Capital Grants Program. This lower section of Mt. Scott Creek has been characterized as a high-priority for instream restoration of rearing habitat for Coho and Steelhead Trout. The requested funds would finance enhancement the installation of large woody debris within the creek channel to increase ecological functions and diversity in the creek for fish habitat. The project also included enhancement of the confluence of Mt. Scott Creek and Camas Creek and installation of two public education overlooks to increase watershed health awareness and provide community stewardship.